At American Vacuum Company, we love VacuFlo central vacuums. VacuFlo is among our best selling central vacuums—and that’s saying something. As one of the biggest and oldest vacuum cleaner companies in the United States, we are proud to “move the needle” with our inventory of VacuFlo central vacuums. And if you are considering a central vacuum system, you should look at VacuFlo. 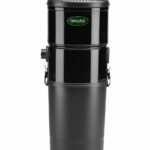 VacuFlo Central Vaccums are proudly assembled in Canton, Ohio by H-P Products Inc. Built-in central vacuum systems have been around a long time. VacuFlo by H-P Products has been around since 1955 when they introduced the cyclonic central vac. You can trust the reputation of Vacuflo as they are a market leader. Vacuflo offers the ultimate in cleaning power along with indoor air quality benefits and convenient cleaning features. 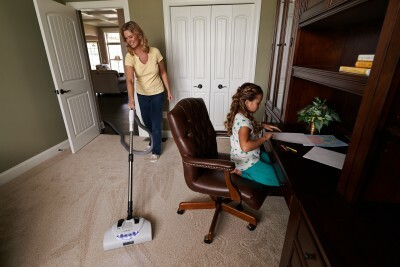 VacuFlo central vacs offer healthier indoors air by removing dust and allergens from your home. Not all built in vacuum systems clean the air like VacuFlo’s whole house vacuum system. We sell (and install) units, kits, hoses and power heads/power nozzles. You name it! Do you want a unit that is designed for your garage or other needs? 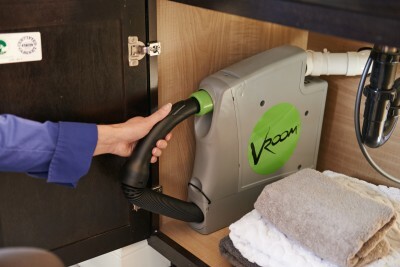 Try the Vroom Vacuum System. Customers love the Edge Electric Kit with Edge Electric Powerhead, telescopic chrome wands, premium brush, etc. We have that too! American Vacuum Company carries the whole VacuFlo lineup. Regarding central vacuum units, we sell the True Cyclonic units such as the VacuFlo 760 and VacuFlo 566Q. 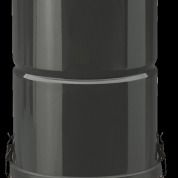 We also carry Filtered Cyclonic models like the FC550 and FC650. 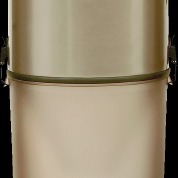 And of course we sell Maxum Replaceable Filter Bag units such as the Maxum 5 and Maxum 7. In other words, we have it all. Do you have a 12,000 square foot home? We sell the VacuFlo Model 760. Is your home just shy of 3,000 square feet? We sell the VacuFlo Model 260. Do you have a gigantic 18,000 to 22,000 square foot home (or business)? Try the VacuFlo Model 960 or MaxAir Power Unit. Check out some of the featured units below, or go directly to our VacuFlo units page right here.